Los Angeles, CA – Nov. 7, 2017 – Stand Up To Cancer (SU2C) and CVS Pharmacy this week released an original video in collaboration with content website Funny Or Die, entitled “Value of a Dollar.” The video shows how a single dollar can make a difference when put towards an important cause. It tells the story of a boy who receives a $1 bill from his grandfather and ventures out to find exactly what a dollar can get him. He quickly learns that he can’t get anything for just one dollar… that is until he walks into a CVS pharmacy store where he can donate his dollar to Stand Up To Cancer. 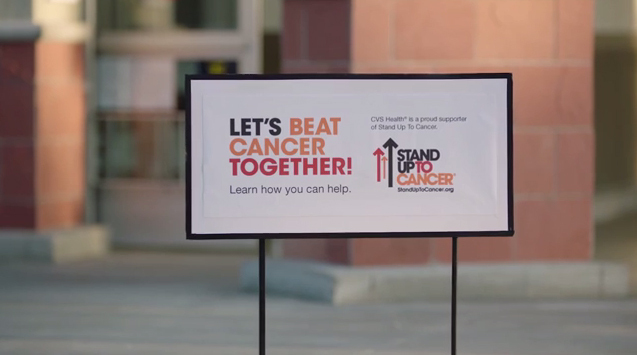 The video raises awareness for CVS Pharmacy’s fourth yearly in-store fundraising campaign benefitting SU2C at CVS Pharmacy locations nationwide. Like the boy, CVS customers can donate $1, $3, or more to SU2C at the register or online at www.StandUpToCancer.org/CVSHealth now through November 19. Funds raised will support Stand Up To Cancer’s groundbreaking research that is helping turn more cancer patients into survivors. Since 2014, CVS Health colleagues and customers have raised more than $15 million to support Stand Up To Cancer’s Dream Teams. During this campaign, SU2C is conducting a #ValueOfADollar sweepstakes to win the “Ultimate Hollywood Experience.” When visiting a CVS Pharmacy between October 29 and November 19, customers can take a selfie and post on their Instagram and/or Twitter with the hashtag #ValueOfADollar and #Promotion to be entered into the sweepstakes* for a chance to win a trip for two to attend the red carpet world premiere of Jumanji: Welcome to the Jungle (in theaters December 20) and a tour of Sony Pictures Studios. For more information on Stand Up To Cancer, a division of the Entertainment Industry Foundation, a 501(c)(3) charitable organization, and to make a donation, please visit www.StandUpToCancer.org/CVSHealth. NO PURCHASE OR DONATION NECESSARY. Void where prohibited and outside US. Must be legal resident of the 50 US (incl. DC) age 18+ (19+ in NE and AL; 21+ in MS) at entry. Sweepstakes begins 9:00:01 AM ET 10/29/17; ends 11:59:59 PM ET on 11/19/17. To enter, take a selfie at a CVS PharmacyTM and post it with #ValueOfaDollar and #Promotion to your Twitter and/or Instagram account(s). You will get 1 entry for each post, and may post once per platform per day. You can also enter by emailing support@su2c.org with subject line “#Valueofadollar Sweepstakes”. You will get two entries for every email that you send, and may email once per day. Maximum 2 entries per day and 22 entries total regardless of method of entry. One winner, chosen at random, will get a trip for winner and guest to the Jumanji® premiere in Los Angeles, CA on December 11, 2017. Total ARV of Prize: [$2,670]. Odds of winning depend on number of entries received. For complete full rules, see StandUpToCancer.org/Jumanji. Sponsor: Entertainment Industry Foundation. All rights reserved. Copyright ©2017 Entertainment Industry Foundation. Entertainment Industry Foundation®, CVS PharmacyTM, Jumanji®, Sony®, and other logos or trademarks listed herein are trademarks of Entertainment Industry Foundation, CVS, or Sony in the U.S. and other countries. All rights reserved. Motion Picture Artwork © 2017 Columbia TriStar Marketing Group, Inc. All rights reserved.